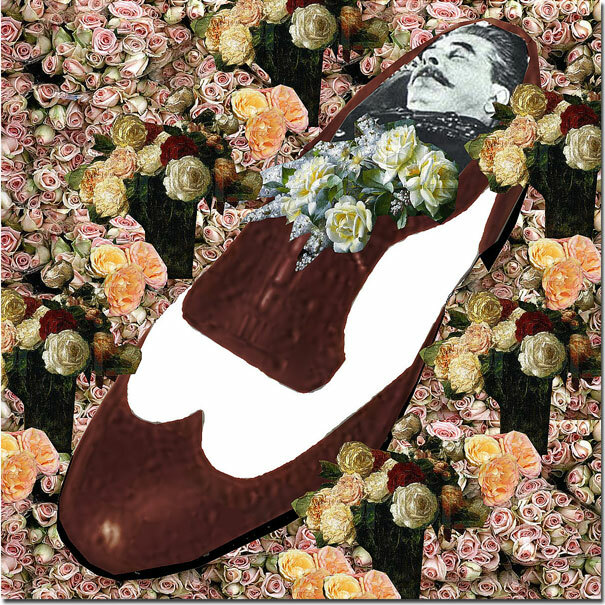 Death of a Shoe Salesman- Digital Collage 6" x 6"
Joe Stalinski lived the American dream. He arrived in Chicago from somewhere in Eastern Europe without two dimes and within a month landed a job at the Roosevelt Road Florsheim Shoe store. There he quickly made a name for himself for his aggressive tactics. In a matter of time he became the store's top salesman. He didn't talk much about what he did back in the old country. Some of the other guys remember him mentioning that he had dabbled in politics Well, it must have been one hell of an education because where selling was concerned the guy was postively machiavellian.On more than one occassion he stole customers from right under my nose. In spite of his ruthlessness, all of us other salesmen begrudgingly admired his dogged determination. Manny Eichenbaum, the store manager, let the top brass know about Joe's numbers.Once a quarter, Mr. Florsheim would show up to shower compliments on Joe and lecture the rest of us about how we should all try to emulate him. This last comment raised a few eyebrows. Howie Schactel whispered to me, "If that was the case, we'd all have to start carrying daggers and shoehorns. Joe suffered a heart attack while attempting to lift a stack of boxes nine high filled with pairs of cordovan lace ups. He collapsed in the stock room scattering oxfords all around. When the ambulance arrived, they lifted Joe onto a stretcher and carried him through the store. As he passed by the curious and concerned Joe mustered his last ounce of strength, sat up and called out, "We're running a special on slippers today. Only ten dollars with purchase of two pairs of shoes or more." and then fell back. He lingered for a few days in the hospital and then died quietly all alone in his room. Out of respect for his passing, Mr. Florsheim arranged for an elaborate funeral, commissioning the factory to fashion one enormous Excelsior Wing Tip for Joe's final repose. Flowers filled every square inch of the funeral home as customers and colleagues filed past the shoe to pay their final respects. In a touching final gesture, Florsheim's number two and number three salesmen, tied the laces, lifted the shoe into an shoebox-shaped coffin, covered Joe in tissue paper, and then put on the lid. Of course all this happened in 1948 when a working man meant something to his employer. These days you'd be lucky to get a ped as a funeral shroud.